Recent controlled studies increasingly show that the effect of a bite of many spiders thought to be toxic for humans are not nasty at all and only simple treatment of the effects and comforting the victim is the best therapy. Only species of four genera of spiders are to be labelled with a red tab with the words “dangerous” or “to be avoided”. The females of some species of the genus Latrodectus, often already red-tabbed on their abdomen, are capable of a bite that can be very painful. Bites of Loxosceles (brown recluse) spiders may cause mild necrosis and conservative wound care seems the best therapy. 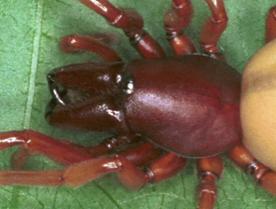 The other red-tabbed spiders belong to the group of Australian funnel-weavers of the genus Atrax and Hadronyche. These spiders are not very common and the “famous” Sydney funnel web Atrax robustus is becoming extinct due to urbanisation of the area where it lives and to wood fires. The other species live outside cities in areas were human habitation is almost absent. Bites of these spiders are not lethal but it is wise to seek medical attention and to catch the spider for identification. The venom of these spiders is neurotoxic and therefore painful. The use of antivenom has not been proven to be effective. Tegenaria spiders can bite. The bite feels like a mild prick and the wound may be red for an hour. Tegenaria (hobo) spiders are harmless. The bite of Dysdera crocata may prick. In exceptional cases the pain will last for a few hours. Dysdera spiders are harmless. The bite of Latrodectus (red-back, black widow) can be very painful for several days. Avoid this non-aggressive spider. The bite of Cheiracanthium (Yellow sac) spiders can be painful and discomfort can last up to ten days. The bite is of no medical importance. The bite of a Lampona spider can be painful. Avoid these spiders. Severe envenomation from a mouse spider (Missulena) bite is rare and not a major medical issue. Avoid the spider. The bite of spiders of the genus Loxosceles can cause mild to nasty dermal necrosis. The best therapy may be the conservative use of simple first aid and local wound care. Avoid these spiders. Phoneutria (Wandering spider, Aranha armadeira) spiders are aggressive and their bite is painful. Severe envenomations are very rare. Avoid these spiders. 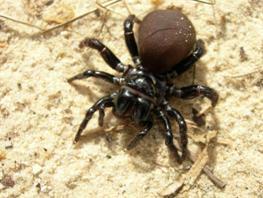 The Australian funnel web spiders Atrax robustus and Hadrychone species bites can cause severe envenomation in 25% of the cases. There are only few reports of severe bites, 64 cases in 23 years. These spiders should be avoided. Until now about 40,000 spiders are described and this is less than half of the expected number of between 100,000 and 200,000 species. Most of the species not yet described are less than 2 mm in body length or live in scarcely explored parts of the world. Spiders have a bad reputation in America and Australia but are far less feared in the rest of the world. 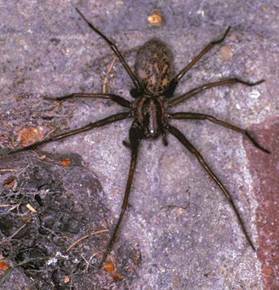 In case of the hobo spider (Tegenaria agrestis) in the USA, it is said the spider is very dangerous and causes necrosis that can cause loss of limbs and even worse. In Europe nobody seems to worry about Tegenaria agrestis and it is perceived as harmless. Their bad reputation is probably caused by a study in 1987 by Vest et al and the fear of that fast running creature that sometimes infests our houses, the spider webs in scary films and the documentaries on television, where spiders are placed in the same category as sharks, crocodiles, and lions and a spider is often presented as an animal that kills or causes awesome necrotic wounds. The effects of spider bites are often exaggerated by the shock of the bite itself. First of all, the person is bitten by a horrifying creature. In the second place, if a skin problem occurs or pain is felt and medical aid is found, the (often useless) medical treatment and the advise of the often ill-informed physician who does not want to take any risk, combined with the medical terms used to describe the infliction, such as haemolysis, vascular leakage, thrombosis, necrosis, envenomation et cetera, are enough to create a big scare. Fangs with poison drops of Atrax robustus. Envenomation is a loosely applied term that means that a significant reaction occurs in response to the injection of venom. Vascular leakage presents as a blue spot after a bump has formed that has caused rupture of a blood vessel. Haemolysis occurs if red cells break down. Most spiders bite their prey with their two fangs, which are directly connected to poison glands located in the cephalothorax, injecting the venom in their prey so that it will rapidly die or become paralysed. A spider wound can often be identified by the two penetration holes, closely together, in the skin. Except for the families Uloboridae, Holarchaeidae and Liphistiidae, all spiders use venom to kill their prey. Spider venom is a combination of several toxins that will work effectively in the spider’s favourite prey. These venoms are not lethal to humans but sometimes they can have nasty side effects. Several recent studies show that a lot of spiders are incorrectly designated as dangerous. Only a few cause deleterious envenomation and some are capable of skin necrosis. There are two basic types of spider venom: the neurotoxic venoms, affecting the nervous system (Latrodectus, Atrax and Phoneutria) and the cytotoxic or necrotic venoms, causing damage to tissue (Loxosceles and Sicarius). The effect of a bite is generally called araneism (spider bite envenomation) or in special cases, latrodectism (black widow) or loxoscelism (recluse). Both types of venom consist of a mixture of proteins and non-proteins. The major biological activity resides in the protein fraction. The non-protein fraction often contains agents that induce pain, enhancing the defence action of the venom. The enzyme hyaluronidase is also often a component of venoms of spiders and insects. It increases the diffusion of the venom in the skin. White-tailed spiders (Lampona) give a painful bite. 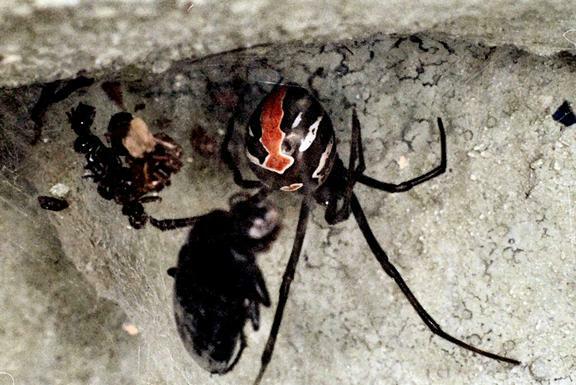 Black widows and red-backs (Latrodectus species) are to be avoided because of their painful bite that sometimes needs hospitalisation. Most biting incidents do not need medical attention. 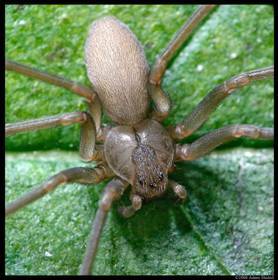 The following three spiders are mygalomorph (primitive) spiders. Because of their large fangs and the effect of their venom their bite can be very painful. 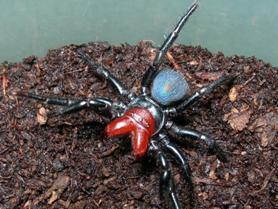 Funnel-web spiders of the genus Atrax and Hadronyche solely live in Australia and are dangerous. They inflict severe bites at a rate of two victims annually. Mouse spider (Missulena) bites may be dangerous but are rare and do not appear to be a major medical problem. 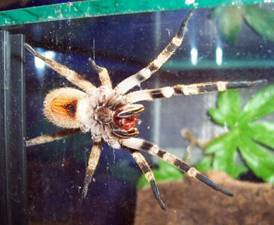 Harpactirella lightfooti: bobbejaan-spinnekop or "baboon spider", a spider from South Africa can give a nasty bite. Wandering spiders (Phoneutria nigriventer) from South America are to be avoided because of their aggressive nature and painful bite. The great majority of cases is insignificant and of benign evolution. All other Phoneutrias do not cause many accidents. Brown recluse spiders (Loxosceles) and Sicarius species possess necrosis-inducing components in their venom and they can cause mild to nasty dermal necrosis. All these spiders and some unmentioned here, may bite and may cause some pain but the symptoms are not of medical importance. Medical treatment like the use of gluco-corticoids, early excisions of necrotic wounds, hyperbaric oxygen, electric shock stun guns, and nitro-glycerine does not seem to be useful. Only in severe envenomation the use of intravenously injected antivenom appears justified, but large controlled studies still have to be performed for a final conclusion. Non- humanised antibodies should not be used carelessly because they can give rise to antibodies against them with nasty transfusion reactions or serum sickness. The use of antivenom is thought to be responsible for the sharp decline in death rate numbers after a spider bite but one has to keep in mind that medical intervention before 1960 may in fact have caused a higher death rate. At present there is little proof of the efficacy of the use of antivenom and the decline in death rate maybe due to the fact that there are no (fatal) experimental treatments on patients any more. Several studies have unravelled the chemical composition of the venoms and their modes of action on mammals. Some of these components may be very useful in understanding and treatment of human illnesses but all experiments reported are done in vitro and the results can not be extrapolated to humans. The following proteins seem to be of major importance in envenomations: alpha-latroxine in Latrodectus species, sphingomyelinase D in Loxosceles and Sicarius species and two delta atracotoxins (δ-ACTX) known as robustoxin and versutoxin in Funnel web spiders. In the following part the toxicity of the commonly feared spiders of the following families or genera: Atrax, Cheiracanthium, Dysderidae, Hadronyche, Latrodectus, Loxosceles, Phoneutria, Lampona, Lycosidae, Lampona, Missulena and Tegenaria will be reviewed. Tegenaria spiders belong to the family Agelenidae CL Koch, 1837 with 123 described species in this genus. Tegenaria agrestis, also called Hobo spider or aggressive house spider, has a bad reputation. 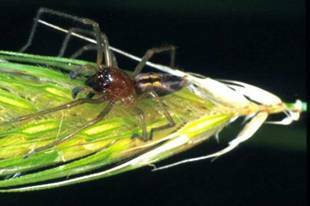 First the misinterpretation of its name; the Latin name agrestis actually means “rural” for the hobo spider's native habitat. 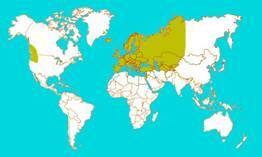 It is a strange fact that this species, which was introduced around 1900 AD from Europe in the North Western part of the USA does not give rise to any medical attention in Europe. The spiders bite can penetrate the skin but it feels like the prick of a small needle. If there are reactions they are very mild. Binford found no difference in venom composition between the European and American species. Tegenaria agrestis in the ÜSA is most probably as harmless as the Tegenaria agrestis wandering in Europe and the possibility that it is the culprit in any incident can be neglected. 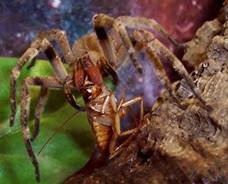 Also living in Europe and the USA are two other closely related spiders, the giant house spider, Tegenaria duellica (known as Tegenaria gigantea to some) and the barn funnel weaving spider, Tegenaria domestica. Both spiders originated in Europe. Related spiders (Agelenopsis potteri, Agelenopsis pennsylvanica and Hololena nedra ) are often misidentified as hobo spiders. All of these spiders are brown, make funnel webs and belong to the family Agelenidae. It can be concluded that the members of the familyTegenaria are harmless spiders. These sheet web builders are common in and around houses in Europe, with the exception of Tegenaria agrestis that is not a common house spider. The size of the spiders varies between 10 and 25 mm. When the male is searching for a female in autumn he can cause a lot of panic when running fast (up to 1 m/s) on floors or when they are found in a sink in the morning. 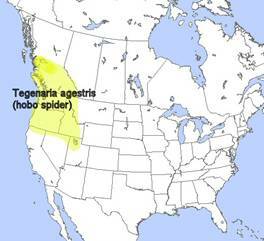 The current distribution of the hobo spider in the USA includes southern British Columbia, Washington, Oregon, Idaho, northern Utah, the western half of Montana, western Wyoming and two small, isolated populations in Colorado. 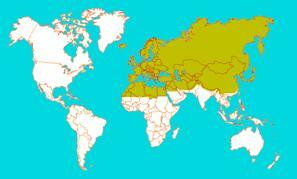 In Europe to Central Asia the spider is also a common sheet web spider. Spiders of the genus Loxosceles Heineken & Lowe, 1835 (Family Sicariidae Keyserling, 1880) are known under the common names of recluse, violin of fiddle-back spiders. The approximately 100 species that are described are found from temperate southern Africa northward through the tropics into the Mediterranean region and southern Europe, and from temperate and tropical zones of North and South America and China. Loxosceles intermedia, Loxosceles gaucho and Loxosceles laeta, living in Brazil, are medically important. Loxosceles laeta is the most toxic. Loxosceles is a six-eyed spider in contrast to most spiders that are eight-eyed. The spider is 9 mm in length and has long legs. 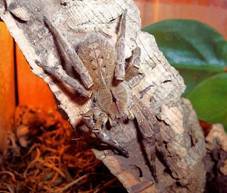 It resembles the Daddy long leg and is called the six-eyed crab spider in South America. The spider is almost hairless and has a violin-like dark pattern on the dorsal site of the cephalothorax. When bitten, mostly at night, no pain is felt. The symptoms occur 6 – 8 hours after the bite. The spider injects a few tenths of a microliter of venom, containing no more than 30 microgram of protein. The active component in the venom is sphingomyelinase D, which can cause necrosis. It has been suggested that sphingomyelinase D activates metallo-proteinases which then remove the sialic acid groups from the glycophorins on the surface of erythrocytes (red blood cells). Complement factor H then fails to bind to the cell surface, what causes complement factor I from inhibiting the enzymatic action of C3b thus resulting in the action of the complement system to haemolyse the victims erythrocytes. In addition, sphingomyelinase D also accelerates the degradation of lysophospha-tidylcholine to choline and lysophosphatidic acid. This ultimately causes platelet aggregation, endothelial hyper permeability and pro-inflammatory responses. 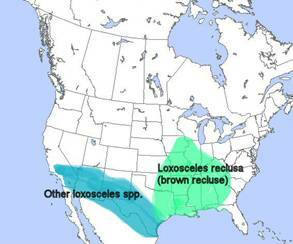 Loxoscelism occurs far less than usually thought. Eighty percent of the suspected spider bites is caused by other arthropods. Since several diseases resemble loxoscelism, any diagnosis of loxoscelism should be considered highly suspect. 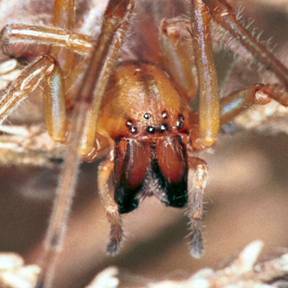 In rare instances bites from the brown recluse can cause dermal necrosis often accompanied by fever, haemolysis, thrombocytopenia and acute renal failure. There is no therapy with proven efficacy for loxoscelism. The prescription of Dapsone and the use of antivenom is questionable because there is marginal evidence for its effect. The best therapy may be the conservative use of simple first aid and local wound care. The bite of spiders of the genus Loxosceles can cause dermal necrosis. The best therapy may be the conservative use of simple first aid and local wound care. Cheiracanthium spiders belong to the family Miturgidae into which they were moved from the family Clubionidae in 1997. The nearly 200 spiders belonging to this family can easily be identified by the first long pair of legs and their stout fangs. The members are documented to be beneficial predators in agriculture. The poisons of Cheiracanthium mildei does not possess the enzyme sphingomyelinase D that is thought to cause necrosis of the skin. The venom does contain the enzyme phospholipase A2, an enzyme that can also be found in the venom of many spiders, bees and wasps. This enzyme is known to be responsible for pain. The stout fangs can penetrate the human skin causing a sharp pain. All recorded cases there was a severe to mild pain for twelve hours and redness. In three cases the pain after a bite of the European Cheiranthicum punctorium lasted for ten days. In one Cheiranthicum punctorium bite case, in 1962, there was a pea-sized necrosis of the skin, but in eleven cases there was no necrosis. Recorded species in 39 verified bites were Cheiracanthium inclusum and Cheiracanthium mildei (North America), Cheiracanthium japonicum (Japan), Cheiracanthium mordax (Hawai), Cheiracanthium punctorium (Europe). The Miturgidae spiders are nocturnal, they live on the ground and are cryptic what means; tending to conceal or camouflage. Most spiders of this family hide and guard their eggs in a sac-like retreat under rocks or other debris. These spiders belong to the family of Ctenidae Keyserling, 1877. Most of the clinically important accidents are caused by Phoneutria fera and Phoneutria reidyi, found in the Amazon region, and Phoneutria keyserlingi and Phoneutria nigriventer (= Phoneutria keyserlingi), which occur in the central-western, southeastern and southern parts of Brazil. The active components in the spider’s neurotoxic venom are acetylcholine and noradrenalin neurotransmitters. These components activate the sodium operating mechanism in nerve and muscle fibre membranes. The bite of Phoneutria spiders causes an intense pain, which spreads through the body. Neurogenic shock is more frequently observed in children and is characterized by cold sudoresis, agitation, salivation, priapism and death. The great majority of cases, however, is insignificant and of benign evolution. The treatment in general is symptomatic (95% of the cases at Hospital Vital, Brazil). In a study conducted between 1984 and 1996 with 422 hospitalised patients one child of three years old died. From 1990 to 1993, bites by Phoneutria spp. accounted for 42.2% of the 11,392 accidents involving spiders in which the genus was known or suspected. Upon hospital admission, most patients presented only local complaints, mainly pain (92.1%) and edema (33.1%) and were classified as presenting mild (89.8%), moderate (8.5%) or severe (0.5%) envenomation. Most of these accidents occurred in southern (39.7%) and southeastern (60%) Brazil. Phoneutria is aggressive and should be avoided. But severe envenomations or even fatal outcome of bite incidents are very rare. These spiders can reach a length of 30 mm and may have leg span of 150 mm and are fast running aggressive spiders. They do not run away when molested, but rise, sustained by two pairs of their hind legs, lifting the fore-legs open, their red-coloured chelicerae ready to defend themselves. They are agile, and climb rapidly upwards the stick or broom that is attacking them. They always seek defence by aggression. They are active hunters during the day and seek shelter during the night, between clothing, under furniture, in shoes or in banana bunches, which could partly explain the relatively high frequency of bites. This spider lives in the tropical and sub-tropical parts of America. Phoneutria (Wandering spider, Aranha armadeira) spiders are aggressive and their bite is painful. Avoid these spiders. Severe envenomations are very rare. White-tailed spiders belong to the Australian family Lamponidae Simon 1893, a family containing around 60 species. The two common species are Lampona cylindrata and Lampona murina. Both are similar in colour and shape. The whole body of these spiders is cylindrical (cylindrata) and coloured mouse gray (“murinus” in latin). Males are up to 12 mm in length and the female up to 18 mm. The distinctive white spot on their tail gives these spiders their common name. Their bite can cause an initial burning pain. Many bites occur while victims are sleeping (30%) or during dressing (40%). In a study by Isbister and Gray, 130 positively identified Lampona bites were studied. None of the patients developed necrotic ulcers. The bite was always painful and in 27% there was a severe pain. In 44 % of the cases a persistent red mark, with associated itchiness and pain or lump remained for 5 to 12 days. Other information sources state that the bite is not remarkable for its pain. The spider is nocturnal and is a vagrant hunter in and around houses under bark and logs. They build a sac-like web to hide in. They feed primarily on other spiders and their favourite prey is the black house spider Badumna insignis. Two of the white-tailed spiders have attracted significant attention, Lampona cylindrata and Lampona murina. 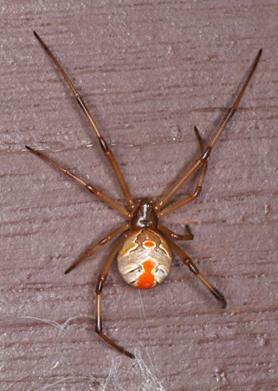 These spiders have a dark reddish to grey, cigar-shaped body and dark orange-brown banded legs. Their size varies between 12 and 18 mm. White-tailed spiders are common in Australia and have been introduced in New-Zealand. 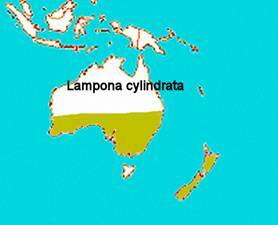 Lampona cylindrata lives across southern Australia (south east Queensland, New South Wales, Victoria, South Australia, Tasmania, Western Australia) and New Zealand. 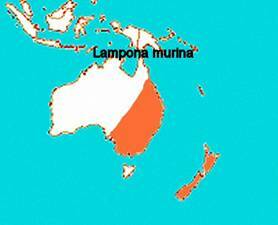 Lampona murina is present in eastern Australia from north-east Queensland to Victoria (Queensland, New South Wales, Victoria) and New Zealand. It can be concluded that the bite of a Lampona spider can be painful. Avoid these spiders. The genus Latrodectus contains thirty described species and belongs to the large family Theriidiidae Sundevall, 1833. Bites of the females of Latrodectus are often initially painful but are also sometimes not felt. The neurotoxin Alpha-latrotoxin in the venom causes in 50% of the people that were hospitalised a severe pain that lasts from one to three days. These results give a distorted view because only people that visited a hospital were counted. The use of intramuscular antivenom seems to have poor results in comparison to intravenous administration but larger controlled groups must be tested to determine the efficacy of antivenom treatment. The use of antiserum may shorten the duration of the symptoms but is usually not required. Analgesics, myorelaxants and calcium gluconate are used to relief the symptoms. The fear for this spider is exaggerated and the word deadly can be removed from its description. Since 1954 no fatal accidents occurred with this spider in Australia, since 1983 no reported deaths from the USA are known and from Europe and the rest of the world no described deaths are known. The spider should be avoided and the effect of the bite can be very painful. The spider spins a web in protected corners of fields, gardens, near stones and woodpiles and in vegetation. They are rarely found indoors. Latrodectus variolus prefers to live in trees. The female builds a messy, three-dimensional, web with extremely strong threads in which she hangs upside down. The female spider is 12 – 16 mm long while males are 4 - 5 times smaller. The male spider does not produce a web and is not considered dangerous for humans. The name black widow originates from the idea that the male is eaten after mating but this is uncommon in the field. The spider is active during day-time. Upon superficial inspection, the animals can be confused with Steatoda paykulliana (Europe) and Steatoda grossa (USA+Europe): false black widows. Latrodectus spiders are not aggressive. The spiders of this family are common in the tropical and sub-tropical regions. 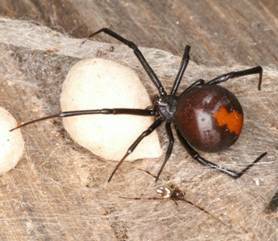 The bite of Latrodectus (red-back, black widow) can be very painful for several days. Analgesics, myorelaxants and calcium gluconate are used to relieve the symptoms. Avoid this non-aggressive spider. There are over 480 species of Dysdera spiders and only Dysdera crocata, who originated from the Mediterranean and Eastern-Europe spread all over the world and can now be found in cold places like Tasmania and Great-Britain as well as in hot places like Greece and southern California. The spider is easy to identify. It has a reddish brown head-breast part and a light brown to yellow abdomen. The spider has two large fangs that she uses to penetrate the armour of woodlice. That is the reason than when she bites humans one feels the prick. The spider is easily agitated and then spread its fangs in defence. Dysdera crocata can be found in and outside the house. Detail of the head-breast part of a female. A study by Vetter and Isbister that covered a time span of four years in the USA and Australia showed that all the reported eight bites occurred in various part of the body. Pain or discomfort occurred in all cases and had a median duration of 40 minutes. One can conclude that. because after four years of study in two continents only eight cases were found and three cases of severe pain were recorded, the bite of this spider is not to be worried about. a Information not available for all patients. The damage done by the bite of Dysdera crocata is due to the effect of mechanical piercing of the skin rather than to the effects of the venom. In the single case with systemic effects, these were only minor and are likely to be secondary to pain or anxiety. This is consistent with the finding that the bite of other spiders also causes only mechanical damage to the skin. Dysderids are free living nocturnal wanderers on the ground or in tree trunks. During the day they hide in a silken retreat under stones and fallen bark. Dysdera is specialised in catching woodlice. These spiders are similar in appearance like all other mygalomorph (primitive) spiders such as the funnel-web and mouse spiders. 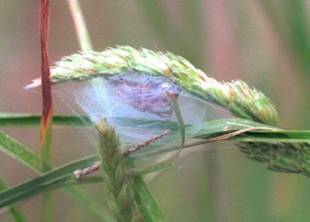 A striking feature is the two long spinnerets at the rear of their abdomen. Other distinguishing characteristics are the cephalothorax with the often large jaws and the small eyes which are grouped very closely together. The Australian Funnel-web spiders (family Hexathelidae, Simon, 1892) are probably the most dangerous spiders we can encounter. 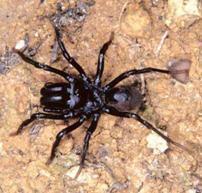 The most famous spider is the Sydney funnel web (Atrax robustus). People are only rarely bitten: there are only two cases of envenomation annually in the last 10 years. Funnel-web spiders belong to the family Hexathelidae and two (Atrax and Hadronyche) of the eleven genera are considered dangerous. Isbister et al. performed a multi-center study on the bites of these spiders and the efficacy of the funnel-web spider antivenom. Of the 40 described species in this family, six cause severe envenomation. In the table, data are shown of the positively identified spider bites and the number of severe envenomations in the last 23 years. No confirmed deaths are registered since the introduction of the anti Atrax robustus venom in 1981. The study also concludes that this antivenom works in all Hadronyche species. Despite the lack of a controlled trial with sufficient patients the use of antivenom does seem justified. While the venoms of most species of Hadronyche and the two unnamed Atrax species have not been studied, those known to have significant clinical effects in man, particularly Atrax robustus, have been examined in detail. There exists a consensus in these studies on the fact that lethal activity (for man) is contained in just one component of these multicomponent venoms. In Atrax robustus male venom, toxicity is consistently several times (4 - 6) higher than female venom. Robustoxin (from male Atrax robustus venom) is a unique presynaptic neurotoxin, lethal in man, other primates, and newborn mice, but non-lethal in many other laboratory animals. It is a protein with a molecular weight of 4854 D, with 42 amino acid residues. Versutoxin (from male and female Hadronyche versuta venom) is structurally very close to robustoxin and there is a strong antigenic cross-reaction between robustoxin and versutoxin. Versutoxin has a molecular weight of 4852 D and contains 42 amino acid residues. Venoms of important related species like Hadronyche formidabilis - are reported approximately equally toxic (both male and female) as male Atrax robustus. They have caused similar cases of envenomation in man (no definite fatalities), and therefore probably contain a robustoxin-like component. Hadronyche infensa - venom is reported to be at least as toxic (females and males) as male Atrax robustus venom, and therefore may contain a robustoxin-like component. Australian Funnel-web spiders are mostly terrestrial spiders, which build typical silk-lined tubular burrow retreats, with a collapsed "tunnel" or open "funnel" entrance from which irregular trip lines radiate out over the ground. Exceptions, which lack trip lines but may have trapdoors, are the Hadronyche from South Australia, like Hadronyche adelaidensis, Hadronyche eyrei and Hadronyche flindersi. The silk entrance tube may be split into 2 openings, in a Y or T form. In the case of Hadronyche formidabilis the burrow may be in the hollow of a tree trunk or limb, many meters above ground level. Adult male spiders leave the burrow permanently to seek a mate. Such wandering male spiders may enter houses, sometimes even find their way into clothing, and thus account for many bites. Most funnel-web spiders are ground or log dwellers but at least two are tree dwellers (Hadronyche formidabilis and Hadronyche cerberea: the Northern and Southern tree funnel web spiders, respectively). 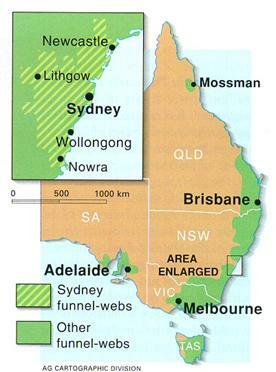 Atrax robustus, the Sydney funnel-web spider, has a distribution centering on Sydney, extending north to the Hunter River, south to Shoalhaven River, and narrowing westwards as far as Lithgow. Hadronyche has a considerably wider distribution; being the coastal areas and highland forest regions from Tasmania to Queensland. Hadronyche insularis Rainbow, 1913; Solomon Is. 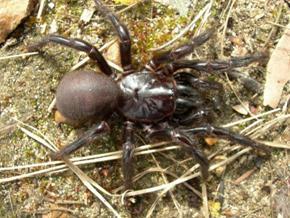 The Australian funnel web spiders Atrax robustus and Hadronyche species bites can cause severe envenomation in 25% of the cases. There are only few reports of severe bites, as only 64 cases in 23 years were recorded. Their toxicity is often exaggerated. These spiders should be avoided. Mouse spiders (genus Missulena, Walckenaer, 1805) belong to the family Actinopodidae, Simon, 1892 and are mygalomorph or primitive spiders. Eleven species have been described. Recently, the toxin d-missulenatoxin-Mb1a was isolated from the venom of Missulena bradleyi, and was shown to be 88% homolo-gous to the Sydney funnel-web spider's robustoxin. A prospective study of Isbister showed that of forty definite bites recorded, one case caused severe envenoming in a child and six caused minor local effects. The conclusion is that severe envenomation from a mouse spider bite is rare (2.5%) and unlikely to be a major medical issue. Because of the homology of the toxin with the funnel back toxin robustoxin and the resemblance in appearance between the mouse spider and the funnel web spider it is advisable to visit an emergency department within four hours to exclude major envenoming. Their size varies between 15 and 25 mm. The common name of the mouse spider is derived from the mistaken belief that this spider excavates a deep mouse-like burrow. Like the trap-door spiders, the mouse spider lives in burrows in the ground, often in banks of rivers, creeks and other waterways, and is sometimes found in suburban gardens. The burrows are built with double or single trapdoors and the entrance is oval-shaped. The burrow can extend to a depth of about 30cm - which is unusually deep for a spider, but not as deep as previously claimed for this species. The females tend to remain in or near their burrows throughout their life, and are sluggish spiders that are rarely aggressive. 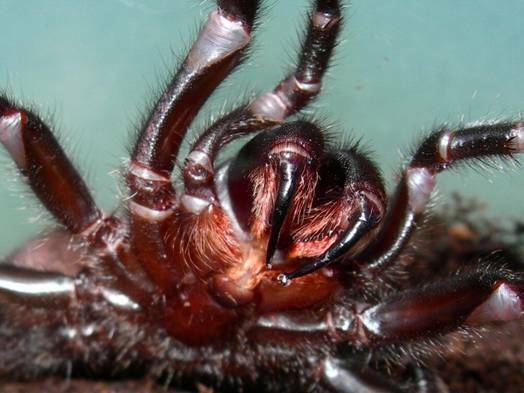 However, Missulena occatoria females have been found to produce copious amounts of highly toxic venom, which is potentially as dangerous as that of the Sydney Funnel-web Spider. A male Missulena bradleyi caused a serious envenomation in a child in the Brisbane region. Males wander during early winter, especially after rain. They will assume a threatening posture if disturbed. Insects are the main prey of mouse spiders. The eastern mouse spider (Missulena bradleyi) lives in eastern Australia from Queensland to Victoria. 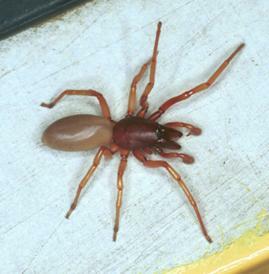 The redheaded mouse spider (Missulena occatoria) occurs across most of the mainland, except southern Victoria and northern Australia. The male of this species has a bright red cephalothorax. 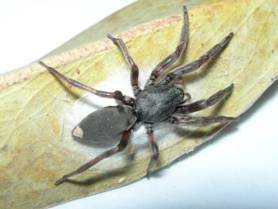 The northern mouse spider (Missulena pruinosa) is found in Northern Australia around Darwin. One species has been described outside Australia in Chile. Severe envenomation from a mouse spider bite is rare and not a major medical issue. Avoid the spider. With thanks to Koen van Keer, Tom Lourens, Stefan Obenauer, Herman Vanuytven and Rick Vetter for their remarks and Colin Halliday for the Atrax, Lampona and Missulena pictures, Dirk Reimann for the Phoneutria nigriventer pictures and Piet Modderman for the final corrections. 3. Binford GJ, Cordes MH, Wells MA., Sphingomyelinase D from venoms of Loxosceles spiders: evolutionary insights from cDNA sequences and gene structure.,Toxicon. 2005 Apr;45(5):547-60. 4. Binford GJ, Wells MA., The phylogenetic distribution of sphingomyelinase D activity in venoms of Haplogyne spiders.,Comp Biochem Physiol B Biochem Mol Biol. 2003 May;135(1):25-33. 5. Black Widow Spider Envenomation, Utah Poison Control Center, 2002, Vol 4, 3. 8. Bucaretchi F, Deus Reinaldo CR, Hyslop S, Madureira PR, De Capitani EM, Vieira RJ., A clinico-epidemiological study of bites by spiders of the genus Phoneutria., Rev Inst Med Trop Sao Paulo. 2000 Jan-Feb;42(1):17-21. 9. Chemical Safety Information from Intergovernmental Organizations, 2005, http://www.inchem.org/documents/pims/animal/atrax.htm. 10. D.L. Swanson, M.D., and R.S. Vetter, M.S., Bites of Brown Recluse Spiders and Suspected Necrotic Arachnidism, N Engl J Med 2005;352:700-7. 11. Diez Garcia F, Laynez Bretones F, Galvez Contreras MC, Mohd H, Collado Romacho A, Yelamos Rodriguez F.,Black widow spider (Latrodectus tredecimguttatus) bite. Presentation of 12 cases, Med Clin (Barc). 1996 Mar 9;106(9):344-6. 12. Dzelalija B, Medic A., Latrodectus bites in northern Dalmatia, Croatia: clinical, laboratory, epidemiological, and therapeutical aspects., Croat Med J. 2003 Apr;44(2):135-8. 13. Ellis RM, Sprivulis PC, Jelinek GA, Banham ND, Wood SV, Wilkes GJ, Siegmund A, Roberts BL., A double-blind, randomized trial of intravenous versus intramuscular antivenom for Red-back spider envenoming Emerg Med Australas. 2005 Apr;17(2):152-6. 15. G. Schiavo, M.Matteoli, C Montecucco , Neurotoxins Affecting Neuroexocytosis, Physiological reviews,Vol. 80, No. 2, April 2000. 18. Isbister GK, Gray MR., Bites by Australian mygalomorph spiders (Araneae, Mygalomorphae), including funnel-web spiders (Atracinae) and mouse spiders (Actinopodidae: Missulena spp).,Toxicon. 2004 Feb;43(2):133-40. 19. Isbister GK, Gray MR., Latrodectism: a prospective cohort study of bites by formally identified redback spiders., Med J Aust. 2003 Jul 21;179(2):88-91. 21. Isbister GK, White J., Clinical consequences of spider bites: recent advances in our understanding. 22. Isbister GK,Gray MR, Balit CR, Raven RJ, Stokes BJ, Porges K, Tankel AS, Turner E, White J, Fisher MM., Funnel-web spider bite: a systematic review of recorded clinical cases., Med J Aust. 2005 Apr 18;182(8):407-11. 23. Isbister GK. , Mouse spider bites (Missulena spp.) and their medical importance. A systematic review. Med J Aust. 2004 Mar 1;180(5):225-7. 24. Isbister GK., Antivenom, anecdotes and evidence, Emergency Department, Newcastle Mater Misericordiae Hospital, NSW. gsbite@ferntree.com. 26. Luciano MN, da Silva PH, Chaim OM, dos Santos VL, Franco CR, Soares MF, Zanata SM, Mangili OC, Gremski W, Veiga SS, Experimental evidence for a direct cytotoxicity of Loxosceles intermedia (brown spider) venom in renal tissue.. J Histochem Cytochem. 2004 Apr;52(4):455-67. 27. Meeteren van LA, Frederiks F, Giepmans BN, Pedrosa MF, Billington SJ, Jost BH, Tambourgi DV, Moolenaar WH, Spider and bacterial sphingomyelinases D target cellular lysophosphatidic acid receptors by hydrolyzing lysophosphatidylcholine., J Biol Chem. 2004 Mar 19;279(12):10833-6. Epub 2004 Jan 19. 30. P Harrington, Robert J Raven, Paul C Bowe, Gabrielle M Hawdon and Kenneth D Winkel, Funnel-web spider (Hadronyche infensa) envenomations in coastal south-east Queensland , Anthony MJA 1999; 171: 651-653. 31. Rash LD, Birinyi-Strachan LC, Nicholson GM, HodgsonWC. Neurotoxic activity of venom from the Australian Eastern mouse spider (Missulena bradleyi) involves modulation of sodium channel gating.Br J Pharmacol 2000; 130: 1817-1824. 33. Tambourgi DV, Paixao-Cavalcante D, Goncalves de Andrade RM, Fernandes-Pedrosa Mde F, Magnoli FC, Paul Morgan B, van den Berg CW, Loxosceles sphingomyelinase induces complement-dependent dermonecrosis, neutrophil infiltration, and endogenous gelatinase expression., J Invest Dermatol. 2005 Apr;124(4):725-31. 34. The World Spider Catalog, Version 5.5, Norman I. Platnick, American Museum of Natural History. 35. Vetter RS, Bush SP. The diagnosis of brown recluse spider bite is overused for dermonecrotic wounds of uncertain etiology. Ann Emerg Med 2002;39:544-6. 39. White J., Debunking spider bite myths, Med J Aust. 2003 Aug 18;179(4):180-1. 40. Young AR, Pincus SJ, Comparison of enzymatic activity from three species of necrotising arachnids in Australia: Loxosceles rufescens, Badumna insignis and Lampona cylindrata.,Toxicon. 2001 Dec;39(12):1941-3.